Officially classed as a ‘racing game’, that doesn’t really describe Up ‘n Down, as you don’t actually race anyone. The point of the game is to collect all the coloured flags whilst avoiding other cars. It’s more of a puzzle/strategy game and it just so happens the you control a car. It’s colourful, cutsie and fun. Released in the arcade in 1983 by Sega, it was converted to the home computers such is the Atari 2600, CollecoVision and the Commodore 64. Released early in the C64s life, it was one of the early arcade conversions to grace the system. Up ‘n Down employs a pseudo-3D perspective where you control a little purple car that more than slightly resembles a VW Beetle. 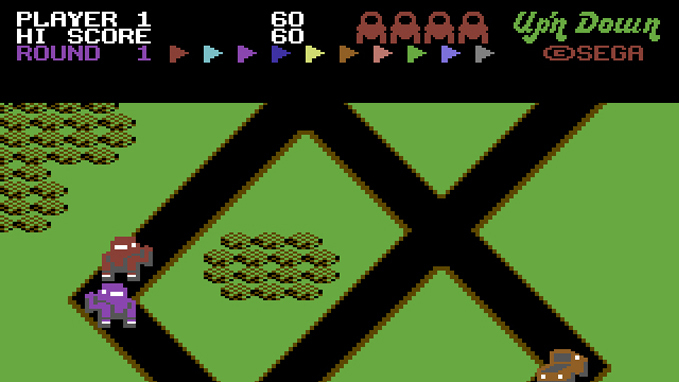 You travel up the screen on a set road which then forks off in different directions which takes you on different routes. You must negotiate this maze of roads and collect all the coloured flags. Once you have all the flags you progress to the next level. On the roads however are a series of other vehicles. They range from slower trucks to fast sports cars. To avoid these cars you must either jump over or on top of them. Judging your speed, their speed and the distance of your jumps is the main challenge. If you jump too far and leave the track you lose a life. There may be occasions where there are a series of cars in a row and you must negotiate them all by doing some pretty accurate, pixel perfect jumping. As you would expect, the further you progress the more cars there are, the roads are more windy and therefore it becomes harder to get all the flags. At times it can be a very frustrating game but there’s something about it that draws you back, to have another go. Given the release date, the graphics are pretty basic. There are however clear and stay relatively faithful to the arcade version. There is however a considerable loss of detail from the arcade, but all in all they did a pretty good job. Pretty good rendition of the basic arcade jingle which also runs in game. Simple sound effects. Nothing special here but back on 84, was probably pretty good. Plays like a dream and the playability is what Up ‘n Down is all about. It’s really simple to get into and after a while, controlling the little car and negotiating the other cars becomes second nature. It had that real pick up and play feel arcady feel to it. The playability has aged fantastically and still plays great to this day. The graphics and sound are pretty primative and do look pretty basic nowadays. An early arcade conversion on the C64 and a pretty successful one. Excellent playability and addictive gameplay. Compared to other arcade conversions on the C64 from years later like the bloody awful Chase HQ, I think they did a good job here and stayed pretty faithful to the original. Well worth a look.